I started translating more than thirty years ago as a small schoolboy. I got hold of a pack of foreign comic books. At that time, in the communist Czechoslovakia, there were almost no comic books available, so we were absolutely delighted to have them. We looked at the pictures but could not understand the texts. I really wanted to have some Czech comic books so I started translating them, at first with a heavy use of dictionaries and occasional help from my relatives who had some language education. I traced the shapes of speech balloons on a white paper and lettered the translated text into them. When the balloon came out well, I cut it out with a pair of scissors and glued it over the original speech bubble. I started translating for a living at university. I got my first orders from fellow students and teachers and later I began to cooperate with translation agencies. In 1993 I started translating for a computer magazine called Bajt which was a Czech version of the American Byte magazine. After graduating from university I have continued as a freelance translator up to the present time. 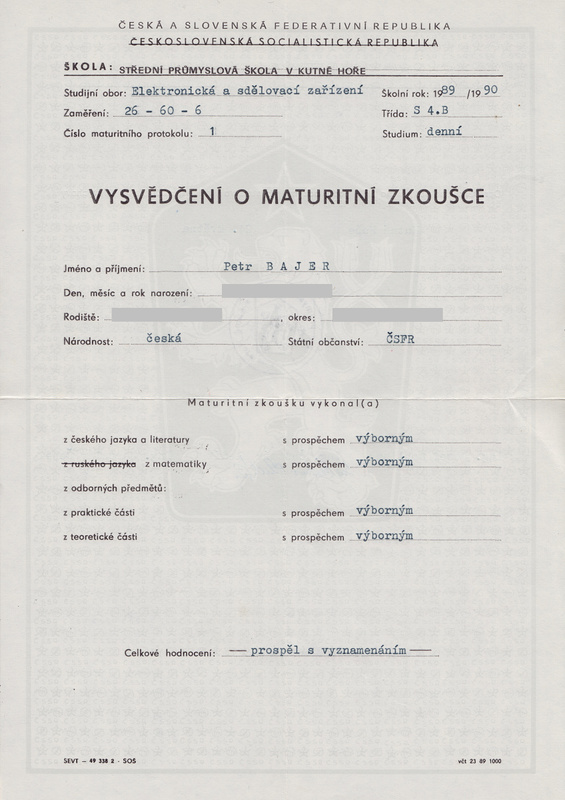 Besides translations I also worked as an English teacher, a computer course lecturer in English and Czech languages, provided user support in English for several software titles, and worked as a computer programmer. I worked on hardware drivers, accounting and database systems, developed several mobile applications, localized software, created web pages and computer graphics etc. After elementary school I studied at High School of Electronics in the field of electronics and telecommunications. I sucessfully graduated with honours. 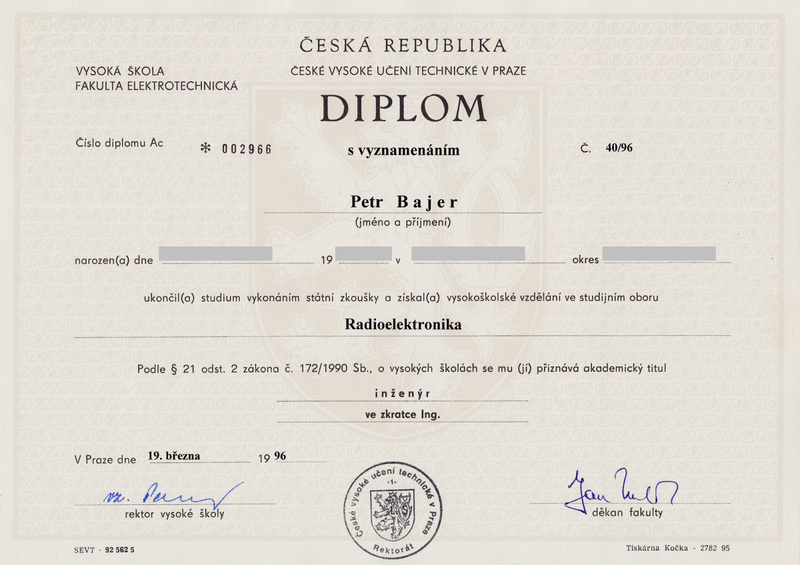 I continued my studies of electronics at Czech Technical University (CTU) in Prague, Faculty of Electrical Engineering, in the field of radioelectronics. This field covers transmission technology including television and radio broadcasting, processing audio and video signals, mobile telecomunications etc. We had quite a free hand in choosing our subjects so I also studied information technology and computer programming. The assignment of my final thesis was development of software for microwave element calculations. I successfully finished my studies with a final state exam passed with honours. I gained the academic title of "Ing. ", which is the equivalent of Master of Science in Engineering (MSE). Because of my interest, zeal and necessity I learned English language by myself from old books of professors Malíř, Osička and others. At that time, English was not taught anywhere in my vicinity. 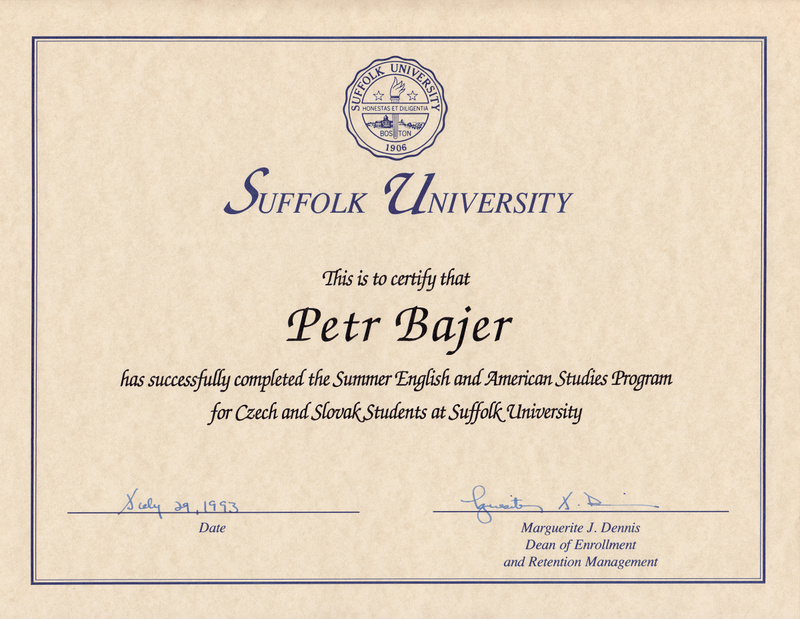 My first English course with a teacher was at high school and then at university. There we were obliged to pass two foreign language exams, one on a lower level and one on a higher level. Passing the higher level English exam was easy thanks to my prior knowledge. 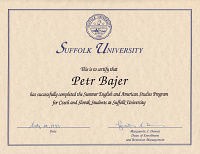 I improved my knowledge of English and American life and institutions during my summer term study at Suffolk University, Boston, USA in the field of English and American Studies. I had an opportunity to hone my English skills not only at school but also in my free time and during weekends thanks to my homestay accommodation with the family of an English teacher from this university. During my second stay in the USA I had another great opportunity to learn about everyday American life. This time I was an au-pair boy in an American family where I took care of two boys. I was very lucky to find a really great family and lots of wonderful experience. I finished my stay with a long independent travel throughout the United States. During my backpack travels round the world I had many other opportunities to practice my English. For instance, I spent some time working on a farm in Ireland. I also had opportunities to learn about life in England during my two stays at language schools in Great Britain with homestay accomodations. 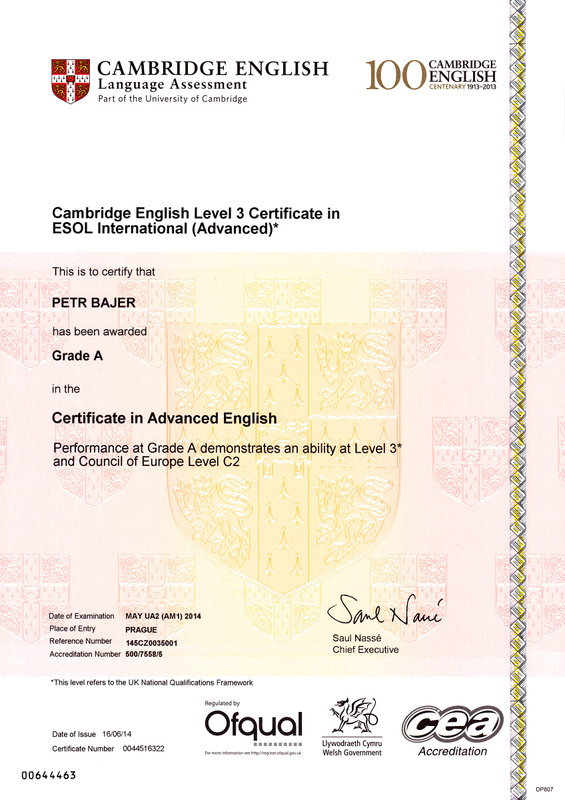 I was awarded a Cambridge English Language Assessment certificate of CEFR language level C2, which is the highest possible language assessment level. According to its definition, this level is approaching the linguistic competence of an educated native speaker. For the record I can also mention here my positon in a long-term leaderboard of English linguistic games in Smart As on PlayStation Network, where I hold the eighth place in the world from a total of tens of thousands of people, including native speakers.